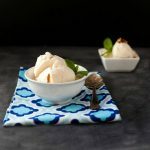 Easy Freezer Bag Ice Cream is simple to make and no ice cream maker is needed. Only a few ingredients and has a low carb and paleo option. Oh, and the low carb version is incredible! In a medium bowl combine: heavy cream or coconut cream, vanilla extract, optional vanilla bean, and sweetener of choice. Mix together well. Pour the mixture into the zippered sandwich bag and zip bag closed. In the gallon size freezer bag add the 4 cups ice and ⅓ cup salt. Place the closed bag with liquid ingredients into the freezer bag of ice and salt. Close the freezer bag. Shake the whole bag for at least 6 to 10 minutes or more until ice cream is the desired firmness. Can shake more for a firmer ice cream. Remove sandwich bag from freezer bag. Rinse closed sandwich bag in cool water to get salt water off of bag before opening, otherwise your ice cream could get salt in it. You can put the bag in the freezer for 20 minutes to an hour, if an even firmer ice cream is desired. Scoop into serving bowl, or eat out of bag.